Now that BP has plugged its disastrous oil spill you might think its PR woes were over. 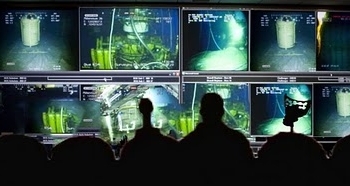 Not so, it has had to admit that an image of its Oil Spill command center was Photoshopped. The fakery was exposed by Americablog, which described BP’s work as so poor that “a 12 year old kid could do a better job”. 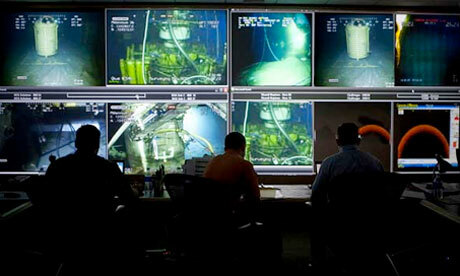 In the photo below, three additional screens’ worth of imagery was added to the monitors, resulting in making the center look busier than it originally did (note we’ve changed the first image below from the one we originally posted as that was an even worse Photoshop than this one, which we believe to be the one that BP originally published). The Guardian reports that BP is claiming that an staff photographer was simply showing off his skills and that Photoshop will now only be used for “Things like color correction, cropping and removing glare.” There’s no mention, however of Americablog’s other charges – that the metadata for the original image allegedly shows it as being taken in 2001 and that more Photoshopping may have taken place. Either way, Photoshopping like this is no biggie, but it is a further embarrassment for a company that has already this year taken probably the biggest PR hit of any company in the past decade.